Also Read : JNTUK Aggregate Calculator (2017 Batch). Also Check : JNTUK Substitute Subjects For Readmitted Students From R10 To R13. Also Check : JNTUK Additional Subjects For Readmitted Students From R13 To R16. Also Check : JNTUK Substitute Subjects For Readmitted Students From R13 To R16. Also Check : JNTUK Promotion Rules For R13 From 2nd To 3rd Year & 3rd To 4th Year. Also Check : JNTUK R16 Academic Regulations, Course Structure & Detailed Syllabus. I Am To Enclose Here with The Copy Of The Government Order Cited, In Which The Govt. Of Telangana State General Holidays and Optional Holidays for the year 2019 & Request You To Take Necessary Action In This Matter. 1. 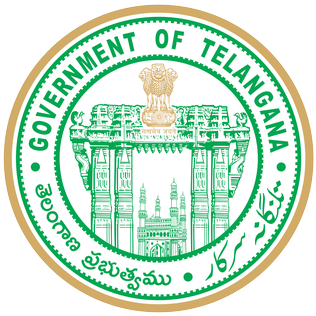 The Government of Telangana hereby notifies that during the year 2019 the days specified in Annexure-I (Part I) shall be observed as General Holidays by all the State Government Offices while the days for other occasions / festivals which fall on Sundays are shown in Annexure-I (Part II) and also notify Optional Holidays for State Government offices as shown in Annexure-II (Part I) while the days for other occasions / festivals falling on Sundays are shown in Annexure II (Part II). 2. The State Government directs that all offices under State Government shall remain closed on all Sundays and Second Saturdays in all the months during the year 2019, except the Second Saturday (09.02.2019) in the month of February, 2019 in lieu of public holiday declared on 1st January, 2019. 3. 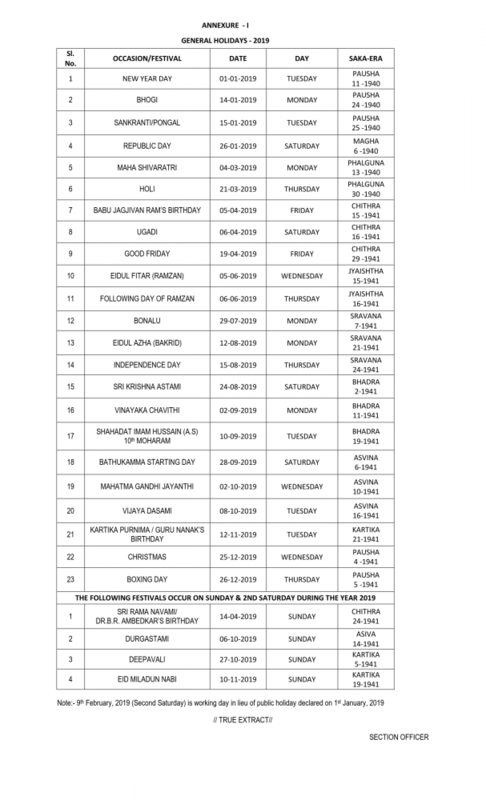 In addition to the above mentioned General Holidays in Annexure I (Part I), the State Government employees may avail themselves of Optional Holidays not exceeding FIVE during the year 2019 on the festival / occasions specified in Annexure-II (Part I) to this order, at their option and irrespective of the religion to which the festival pertains. Permission to avail any of these holidays shall be applied for, in writing in advance and will normally be granted by the Superior Officer competent to grant casual leave except when the presence of an individual employee is considered necessary in exigencies of Government work. 4. The Government also directs that General Holidays shall not ipso-facto apply to the Industrial Establishment and Public Undertakings under the control of the State Government, the workmen engaged in Public Works Departments and Educational Institutions in this State. Separate orders regarding the festivals/occasions when these Institutions observe holidays shall be issued by the concerned Administrative Department of the Secretariat. 5. If there is any change of date in respect of Idu’l Fitar, Idu’l Zuha, Muharram and Id-e-Milad as per the moon sight or any other holiday declared now, it shall be announced through electronic/print media. All the Departments of Secretariat, Heads of Departments and District Collectors shall take action according to such an announcement and without waiting for formal order about the change of date. 1. Birthday of Hazrath Ali (R.A) on 21.03.2019 (Thursday) which would have been Optional Holiday is declared as General Holiday in view of Holi. 3. Naraka Chathurdhi on 27.10.2019 which would have been optional holiday is declared as General Holiday in view of Deepavali. So Above We Have Provided General Holidays and Optional Holidays for the year 2019 For Telangana State. So Students Who Are Studying In Any Telangana State Can Now Check & Download Telangana State General Holidays and Optional Holidays for the year 2019 Official Notification. So, Above You Can Get Complete Info Regarding Telangana State General Holidays and Optional Holidays for the year 2019 . You Can Simply Bookmark This Page As Well In Order To Check All Info Regarding Telangana State General Holidays and Optional Holidays for the year 2019 In The Future As Well. So Do Book Mark Our INJNTU.COM Page & Install Our Android App To Get All Notifications About Updates & Results Directly On Your Mobile Phone. 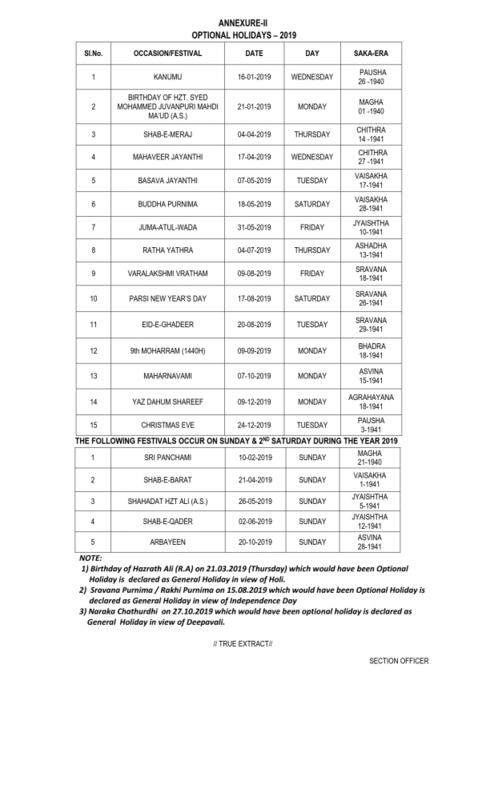 Don’t Forget To Share This Info RegardingTelangana State General Holidays and Optional Holidays for the year 2019 Among All Your Friends & Colleagues. Make Them Check Their Info Regarding Telangana State General Holidays and Optional Holidays for the year 2019 Also Share This Info On Your Social Media Pages. You May Get In Touch With Us Anytime If You Are Having Any Complaint, Query (Or) Suggestions. To Get In Touch With Us, Simply Leave A Comment Below & We Will Revert Back To You As Soon As Possible & Will Resolve The Issue(S), If Any.